What’s Fab Lab London about? Fab Lab is a global movement of over 300 labs, emerging from the MIT Bits & Atoms Lab in 2001. Fab Lab London has just opened and is now operating in the heart of the City of London, based between the Bank of England and St Pauls. In essence we are a rapid prototyping and digital fabrication creative workshop for computing, electronics and design. This is complemented with very latest small scale fabrication equipment, including CNC milling, laser cutting and 3D printing. It is the perfect combination of hardware and software. In Fab Lab London most days you will find a mixture of students, designers, engineers and early stage growth companies who are learning and building products. How did it come to be here? Fab Lab London has been set up by Ande Gregson and Tony Fish, both of whom have had very successful businesses and careers and see this as part of giving back to the same community. In reality Fab Lab London came about because of support from a dedicated collective of designers, technologists, social entrepreneurs and passionate individuals. The team helped source the location, find equipment, build the environment, create a launch event, draw up agreements and identify technology partners. 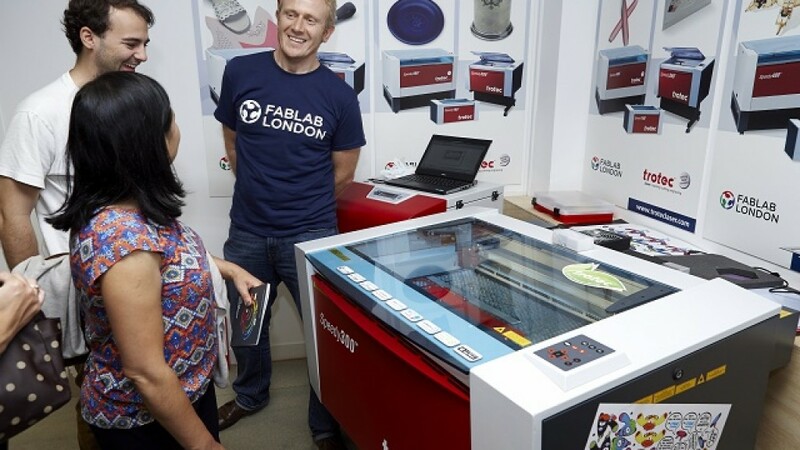 This is what makes FabLab London a unique community initiative. Ande has a creative industries, media and technology background which is rounded with business skills and a ‘lets just do it’ approach to projects. Tony has an electronics and engineering background, has built and sold a number of businesses and acts as an early stage investor. In many ways the next phase of product development, which is where Fab Lab is focussed, is a combination of design, electronics, computing, business and funding. Our motivation for building and running the lab is to provide individuals and early stage growth businesses with a place to build and test ideas as they start their journey. For designers we can help visualise products for clients and for students we provide access to the very best new ideas and tools as part of their education. We open the lab to a school once a week and run a day-long class to enable the students to build a variety of projects involving design skills, electronics, computing, science, art and digital fabrication. There is an open access day every Friday to give members of the public access to events, education workshops and a taster of what’s possible with digital fabrication. The rest of the time it is open for our members.